It feels a little more real even as I type this. We are in the final stretch of our home study. There is no match yet, no sweet baby to call ours. We are basically at the starting line, but what God has been doing in our hearts has been happening for a while. I remember sitting at a table with friends many years ago and listening to them share their hopes of adoption in the future. As I sat quietly I could almost feel everyones eyes drift over to me. 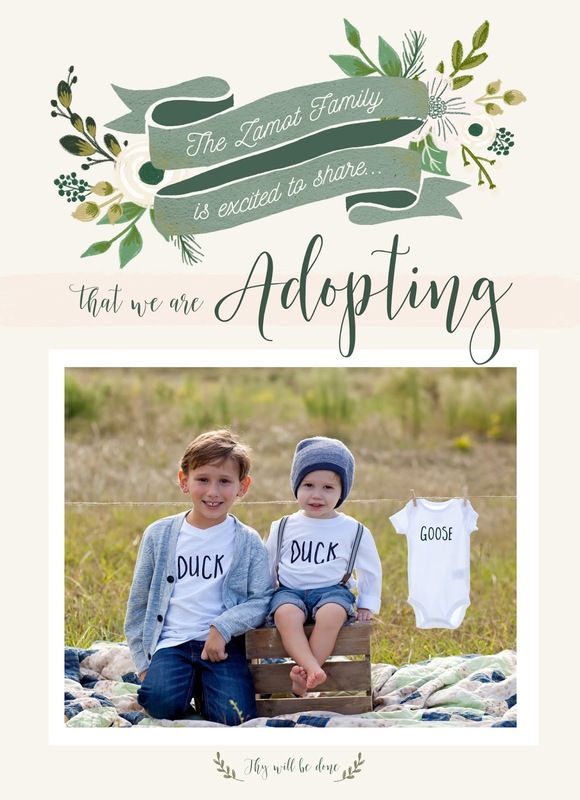 “I’ve never actually considered adoption,” I admitted. I’ve always thought it was wonderful but I honestly had never thought about it for our family. In the year that followed I watched sweet new friends of ours walk through adopting their first son. From the moment we heard they were adopting, Luis and I knew God was giving us a front row seat to watch their journey unfold. When their sweet son was born I had the honor of going to Georgia to take his newborn pictures. It was there that I felt the Lord stirring something in me. I wanted to chalk it up to baby fever, but it felt different. I snapped this picture as we drove away from the house we stayed in, knowing it would be a great reminder of that weekend and what the Lord was doing in me. I posted it on Instagram on August 20, 2013 with this caption: "The past 48 hours have been some of the most exhausting and yet spiritually refreshing days I've had in a while. I was privileged to watch Judd & Katy hold their long awaited son, Jett. Every second of this trip was a picture of God's goodness and a beautiful reminder that His plans are always perfect. I'm so grateful to have been a small part of a big story and incredibly thankful that the Lord has used it to speak sweetly to my own heart." And in a way that only the Lord could orchestrate, Luis was completely ready for me to say that. He had been doing the same thing in Luis’ heart even though he had never spoken a word of that to me. November 17th, the day my world changed. "One year ago today, my life changed. Not just one of those bumps in the road, or small little changes. A forever kind of drastic change. It was the afternoon of November 17th, and my mom wasn’t feeling well and after seeing a few doctors that week, she ended up checking into the ER. As my dad and her left for the hospital, Luis and I left to take Greyson to get his first true haircut. As I buckled my seatbelt, my eyes filled with tears. 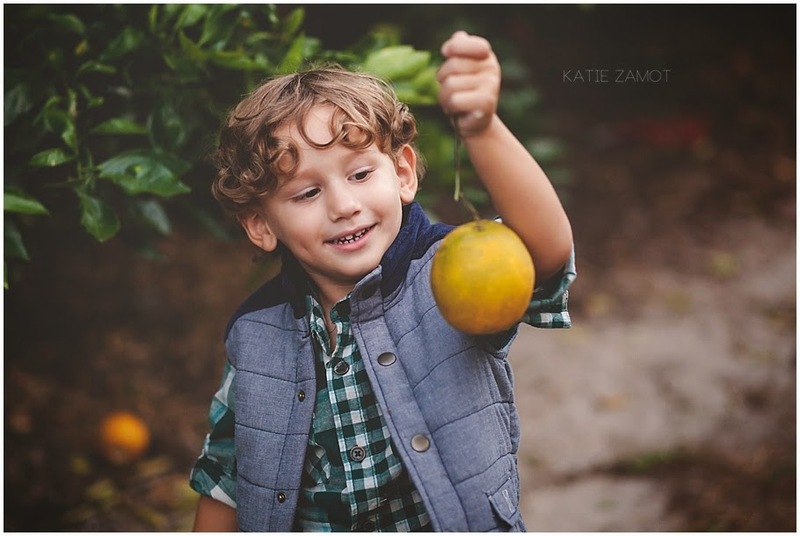 Luis thought I was crying because we were going to chop off all of Greyson’s curls, which, let's be honest... under normal circumstances he would've been right. I hadn't wanted to part with those curls at all. But that wasn't why. I knew in my heart that my mom wasn’t okay. I knew it was serious. I believe she knew it was serious, even though she never actually said it. A few days before she passed away she handed me a tiny, tiny bracelet that I had seen thousands of times before. It hung on her dresser as far back as I can remember. But for the very first time she told me the story behind it. She said that after years of trying to conceive and experiencing her first miscarriage her grandmother found this bracelet on her property. She picked it up and noticed it had my dad’s initials (S. Johnson) surrounded by blue and pink beads. She gave it to my mom and the following month my mom was pregnant with me. As she handed it to me she smiled. I cried. I knew that whenever I saw those two pink lines I wouldn’t be sharing that news with her. 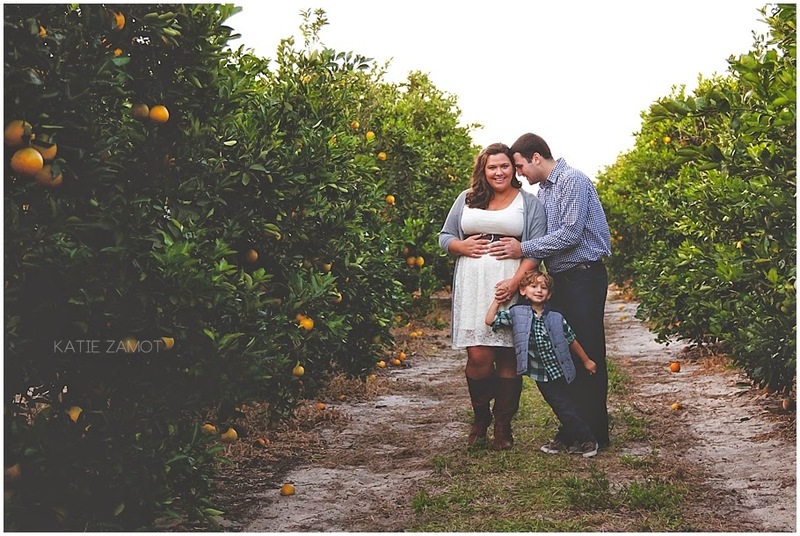 We found out we were pregnant six weeks later. Although I couldn’t call her to tell her, it felt like she was a part of it. So instead of mourning through today I chose to celebrate Liam and my mom. I can't wait to meet this sweet boy and when he is old enough to understand we will tell him how he got his name. I'll also be sharing the story of how these pictures happened... the fact that we went to do them and ended up on an hour and a half monster truck tour instead. We went back the second day and set up a tripod with my camera... no one there to push the button for us! 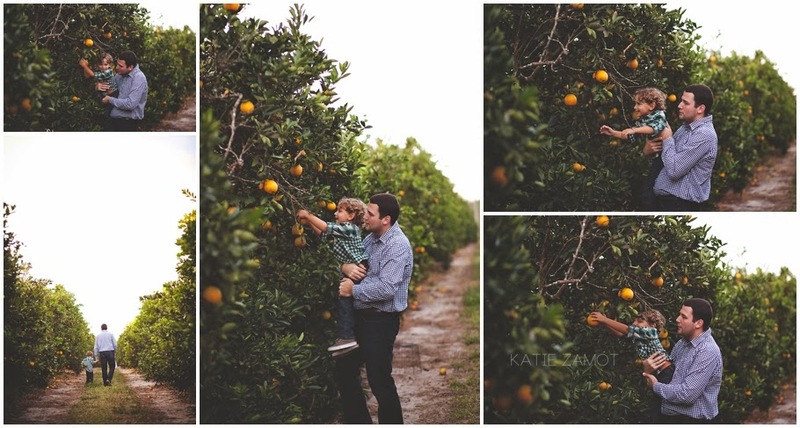 And even though the sun was almost down but we managed to capture a few pictures that we'll treasure forever. We were shocked at how well Greyson did looking at a camera with no one behind it!" It was in her lungs and it appeared to be in her liver. My world stopped. That night we sat at the dining room table and cried. My mom made it clear she didn’t want to do chemo. She wasn’t interested in treatments that couldn’t cure her and would only prolong a low quality of life. She had always said that would be her reaction but now her words were real and painful. We had no idea what to think but she agreed to see all of the doctors and get as many answers as she could, for us. Over the course of the next few days we found out what type of cancer it was and that it had spread throughout her entire body from her skull to her knees. There was no chance of survival. The doctors estimated that she had only had it for a few months because of testing she had done six months prior that would have caught it. On Monday, November 25th, my 29th birthday, we met with an oncologist for the first time. He told her that if she wanted to survive the next couple of weeks, she didn't have the luxury of waiting to start the chemo another week, and with their office being closed for Thanksgiving break he suggested a quick plan. He told her that with 6 rounds of chemo, spread over 18 weeks, we could expect to have another 8-24 months of good quality of life with her. After discussing it we all decided that time was something we all wanted. She made me promise that if she went through the chemo, she could name our next baby. We had been trying for baby number two for a while at this point. So, 36 hours later she was admitted to the hospital to start her first round of chemo. I remember sitting in her room all day, just the two of us, waiting for the unknown to begin. She keep offering up the craziest baby names you’ve ever heard, while reminding me that I HAD promised to let her pick. It lightened the moment and took away the fear, even if only for a brief second. She finished her chemo treatments and passed away six weeks later. But it gave us a total of six months with her that we wouldn’t have had otherwise. She never wanted to do the chemo, but being the selfless wife and mother that she was, she chose to do it. It gave us time to grieve with her and time to say and do everything we wanted to do with her. Those were the most valuable six months of my life. No doubt the hardest six months, but I am so thankful to have had them. She taught me a lot. More importantly, the Lord has taught me a lot about who I am, who He is and, even, who my mother was. Liam’s middle name will be Thatcher, which means “one who mends.” This name seems incredibly fitting for the season of life we are in. When we picked Greyson’s middle name (Micah, which means, “who is like the Lord?”) we wanted it to be a name that we could always point him back to and remind him who God is. 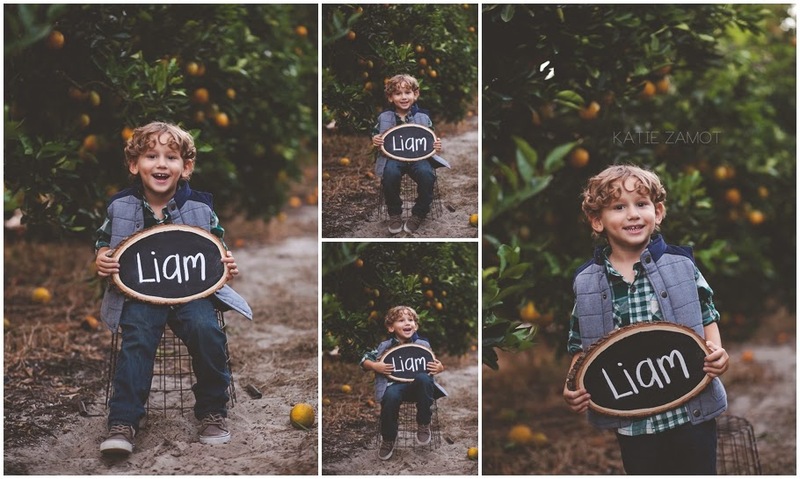 We hope to be able to do that with Liam as well- to point back to this season of life and talk about how the Lord upheld us and mended our broken hearts during our darkest hours. Finding out we were pregnant with him was only one of the ways the Lord has mended my broken heart. I know that Liam will face heartbreak for many different reasons and through different seasons but we will always be able to point back to this and remind him how good the Lord is, even in the ugliest parts of life. 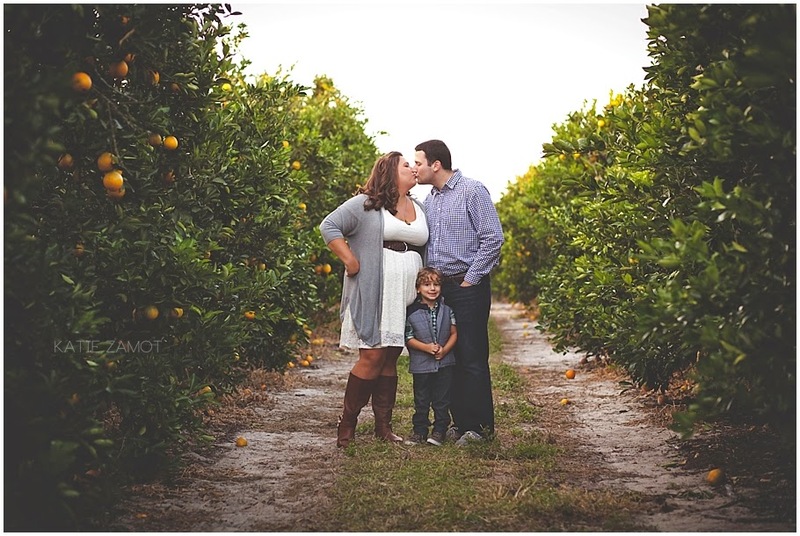 Several years ago Ashby life was turned upside down when she lost her husband. I joined a Facebook group committed to praying for Ashby and her son Trooper. What a privilege it has been to watch God reveal Himself to her in the darkest of seasons and truly create beauty from ashes. She recently shared this note in the group. I loved what she shares about Daniel in Lions Den and think we can all relate in different seasons. Thanks Ashby, for sharing your journey and always pointing us back to the One who fights for us. Ashby is a stay at home mom to two boys and is a big fan of scuba diving, kombucha and wedge heels. The the most important thing about her is that she was rescued by the greatest Warrior of all time and has proclaimed His goodness through the hardest season of her life. While five and a half months pregnant with her first son Trooper, Ashby was suddenly widowed. She watched God fight for her as he carried her and wiped away her tears. He held her when she cried. He held her when she screamed. He held her when she was afraid. He held her when she was depressed. He held her when she wanted to die - but he sweetly reminder her she had a reason to live. The Jesus she had known for years became more important to her because she got to know Him better than she ever had before. Five years later, she has remarried and incredible French carpenter and they recently had another son name Boaz. She still has hard days but her life is FULL of good days. "We don’t always know what to pray for/ask for. My son, Trooper, asks for macaroni and cheese at every. Single. Meal. 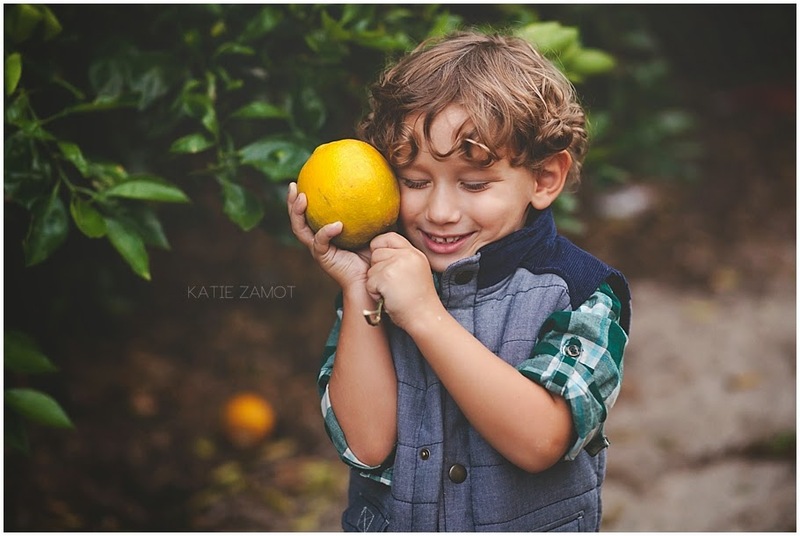 As his parent, I know that would not give him the necessary nutrients to help his body and mind function or grow. He doesn’t ask for a spinach salad but he unknowingly gets one in his “chocolate smoothie” because I know what’s best for him. The same goes for us. The Lord is sometimes less concerned with our comfort and more concerned with our character. Less concerned with our happiness and more concerned with our holiness. What we often don’t see, is that a strong character and holiness lead to true joy and happiness. Sometimes we get loved on from the most unlikely sources and transformed from the most unlikely experiences. Sometimes we get an answer we didn’t want only to realize He knew best all along. Sometimes we think He doesn’t hear us at all and that our prayers go unanswered when in reality they were just answered in a way we weren't expecting. Our greatest mistakes can often be from being unable or unwilling to see and be grateful for the answer we never thought to ask for. As I was writing this, my precious friend Kim called and we were sharing what has been going on in our lives the last few months. She told me that during one particular experience, the story of “Daniel in the Lion’s Den” (Daniel chapter 6) resonated with her in a new way. She was praying for something to go a particular way that it didn’t. But when all was said and done, she saw that she was cared for and preserved the whole time, much like Daniel. She said I’m sure Daniel prayed that he would not be thrown into the lion’s den at all but he was. I’m sure he prayed once he was in there that the lion’s would die so they wouldn’t eat him but they didn’t. But God DID preserve him. 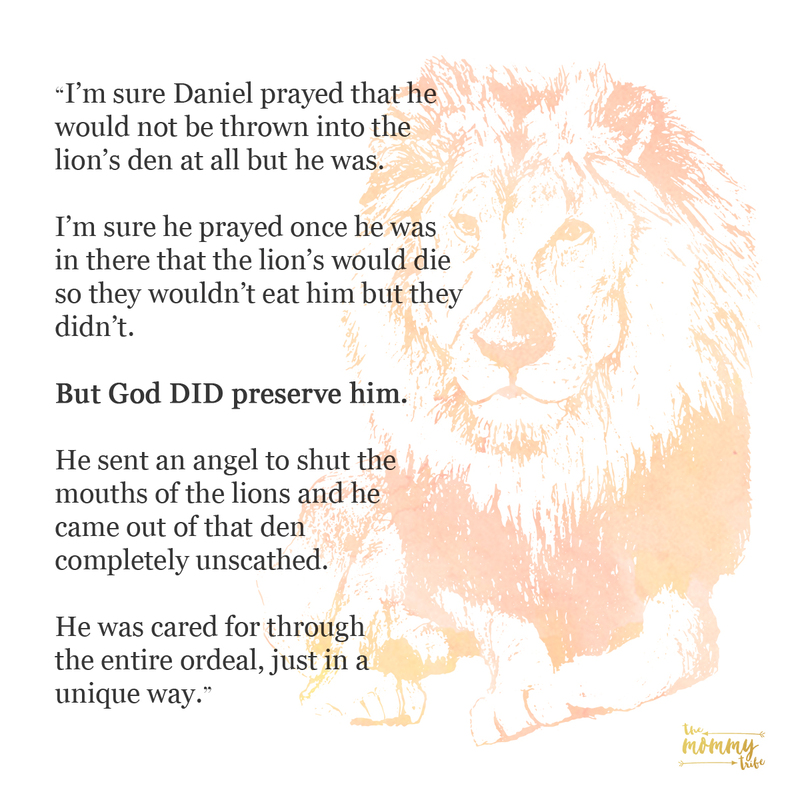 He sent an angel to shut the mouths of the lions and he came out of that den completely unscathed. He was cared for through the entire ordeal, just in a unique way. Isn’t that often how it goes? He does not necessarily take us out of the stressful experience but He always beautifully and creatively answers us in a way that shows we are cared for, preserved and loved. What if we prayed without a specific answer or solution in mind? What if we brought Him our request or problem and asked Him to do what He wanted in that situation? I wonder if it wouldn't alleviate a sense of frustration or disappointment and instead release a feeling of joy and excitement as to what He might do. Unanswered prayers or unlikely answers. Look for the ways He loves you. “Like a tidal wave washing over me” is a lyric from a song that so describes the imagery of His fierce love for us. His love can look different. Christ’s love for us cost Him His life but gave us ours. When we are tempted to look at a situation where He seems silent or the answer isn’t coming as quickly as we would like or maybe even in the way we would like, we need to ask for eyes to see Him at work. Instead of rose colored glasses, we need “love covered” glasses. Our perspective always needs to have His love in the equation. When we seek to understand how much He loves us, we are able to see clearly. Our problems can always overwhelm us when we forget that we are overwhelmingly loved by Him. “And may you have the power to understand, as all God’s people should, how wide, how long, how high, and how deep his love is.” Ephesians 3:18 That is my prayer for you in whatever season you are in. That you would catch even the smallest glimpse of how MUCH Jesus loves you." If you're like me, you send your little one off to spend a portion of their day with someone else. That person is responsible for loving, instructing and caring for my little ones when I'm not there. I will never forget the first day I dropped Greyson off at pre-school. He was four and it was his first time in school. I've left him hundreds of times at church nurseries and with friends or family but it felt wrong to drive away leaving him with, at the time, strangers. All the women I had met at the school had been nothing but wonderful and kind but leaving a piece of my heart in their care felt unnatural. Fast forward several months and I have fallen in love with his school, the staff and most importantly his teacher. She's darling and incredibly brave to spend her day with 4 and 5 year olds. Honestly, how do teachers do it? 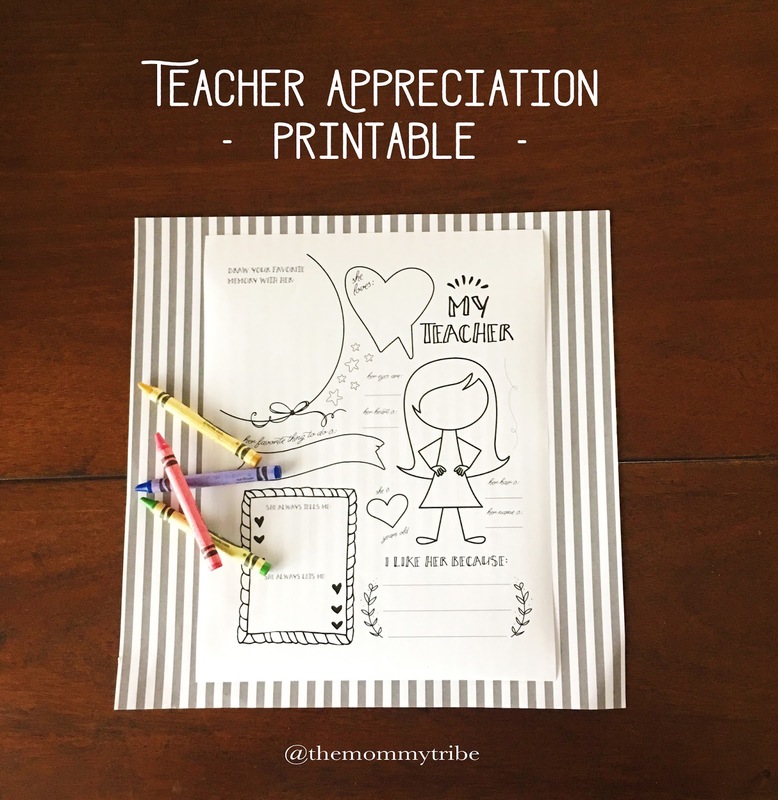 Did you know its teacher appreciation week? It kind of snuck up on me…. maybe it did for you too? We dropped off Dunkin Donuts for all the teachers today with a note that said (And when I say note…. I mean I wrote on the box with a Sharpie…. I told you it snuck up on me!!) "We DONUT know what we would do without you!" 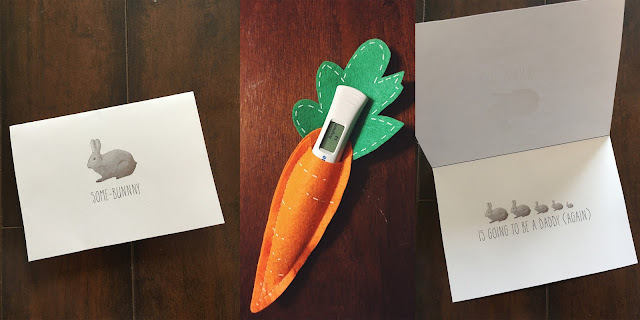 If you're looking for something simple and sweet for your little one to take in to show his teacher how much he or she cares, use this printable. Simply click the link, download, print and ask your little ones the questions and fill them in. Hand them some crayons and let them make it "beautiful." Enjoy…. 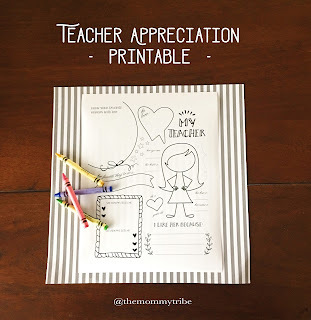 and make sure those teachers know just how much you appreciate them loving on your littles! I had hoped to share exciting news of our third pregnancy with you yesterday, as we celebrated our six year wedding anniversary. Instead, today I am sharing our story of loss. Two weeks ago we had a miscarriage and lost our sweet, little baby. Although this pregnancy was strongly desired, I was still in total shock when I saw the two pink lines and even more shocked when I saw PREGNANT on the digital test. I honestly expected to endure a long journey of trying, like we did with our second. I could hardly hold the news in but decided I would share the exciting news with my husband on Easter morning with a card I made and a pregnancy test tucked into a cute little felt carrot. I don’t know if I’ve ever been so excited for Easter morning to come! He was thrilled when he found out but admitted he started to suspect something when I insisted on filming him while he opened his card.... but I am so thankful to have that 45 second video. It captures a small glimpse of the joy this baby brought into our lives. Several people have asked me how I am feeling and the truth is - I feel good... maybe the word is peaceful. 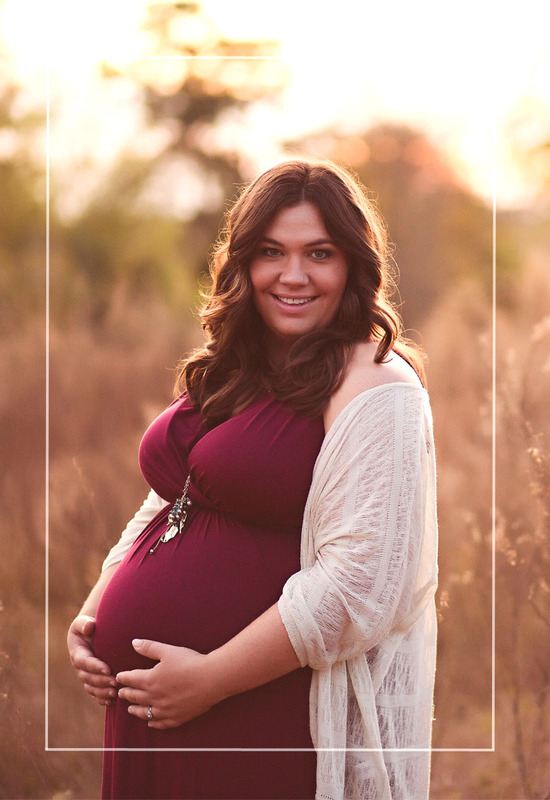 I almost feel guilty saying that because I know the struggle of infertility and I would never expect it to be someone else’s answer. There is deep sadness at what was lost but at the same time, for me, there has been true peace. This sweet baby’s life has taught me so much and I can say that it has helped me to know the Lord even more. The day I saw those two positive tests I immediately thanked God for that life, knowing that He is THE giver of life. We quickly anticipated juggling three kids, having to use the third row in the van, and possibly buying PINK clothes. We talked names and began to plan life as a family of five. Although I will never rock that baby in my arms or hear its gentle giggle, I can rest knowing that God works all things for my good. For much of my life I heard that verse tossed from a stage or taught in a bible study but now I have experienced it and I truly believe it. It’s not a bandaid for crummy circumstance. It is the foundation that I now build my life upon. I have seen the goodness of the Lord in my lowest of moments. The moment we knew for sure we had lost the baby I mentally went back to the other hard times in my life - the ones you don’t think you’ll survive. Those are the moments that you wonder where God is. You wonder if He is with you… or if He cares… and then you make it through and you look back and see how God took care of you every step of the way. He grew you. He blessed you. I’ve been in relationship with Jesus long enough to know that He IS always with me, even in the valley where the lessons are hard and long. This time it didn’t take getting to the other side to see God’s goodness and for that I am incredibly grateful. The valley felt familiar and I never felt abandoned. This time there was peace and assurance of God’s best. God’s best? Wouldn’t that mean answering my prayers and saving our baby? Not this time. God’s best for us was losing that baby exactly when we did. It absolutely would not have been our choice (in fact we were earnestly praying the very opposite) but I trust that God always chooses what is best for us. I cant see the future but I do know that I could have experienced something that would have broken me even more. I could have carried that sweet baby to 30 weeks and then had to say goodbye. I could have delivered him or her, held them in my arms and had to let them go. I could have delivered a baby that would live a life of only suffering, and while I would have loved that baby for every second of its life, it would have wrecked me. So yes, I believe God chose what was best for me and for that sweet baby. It reminds me of a time when we had taken Greyson to Cracker Barrel for lunch when he was three. We offered to take him out for ice cream after lunch. He was so excited but as we walked out he noticed the Checker boards and rocking chairs. He asked if we could sit and play. We explained that we only had time to play Checkers or go get ice cream. We just knew he’d pick ice cream, because it was such a RARE thing for us to do. Tell me what three year old doesn’t pick ice cream?! He quickly chose CHECKERS. We explained it a few more times and even warned him we thought he would prefer ice cream. Finally, we sat down and played checkers. When we were done we loaded up in to the car and he asked for ice cream. My heart broke. He cried the entire way home. As his parents we knew he would rather have the ice cream but his three year old brain couldn’t walk past those red and black game pieces. I’ve gone back to that experience several times the last few weeks, remembering that I cant see past this moment. I cant look past wanting that baby in my arms. Wanting this baby may be similar to picking Checkers. But luckily, I believe in a God that can see all of my days and I can trust him, knowing he will always choose the ice cream for me. I also believe we each and every life was created to glorify Him. What does that mean? Our sweet baby did just that for the whole of its short life. From the moment we knew of its existence until this very day, this baby has done nothing but point us back to God and remind us of His greatness. What a precious life that I am so thankful for. As much as I wanted this baby to end up in my arms, it's bittersweet to know that this one is in my moms arms. I’m even more anxious for Heaven and eager for that sweet, sweet reunion. A few weeks ago I threw a party for my son’s first birthday. As I started to think of ideas and plan a my decor I looked around my house and was horrified. We’ve lived here almost two years and I don’t feel like I have a single room exactly how I want it. I don’t have my backsplash up in my kitchen because I didn’t like what our builders were offering and I just knew we’d be able to get what we wanted up pretty quickly. There are areas in our living room where we repainted our baseboards and some of the white paint got on the walls. While it happened I thought, ‘Oh, no problem. I’ll fix that during nap time one day.’ Well we’re about 600 nap times in and I still haven’t fixed those little areas. The fabric on our relatively new couch is pilling. Honestly, to say it's pilling is putting it kindly.... its basically shedding itself and I’m currently waiting on approval for new cushions from the manufacturer. So my guests will have to sit on that, I guess? I have beautiful dreams for my dining room. Gorgeous light fixtures. Shiplap. My great aunts silverware displayed in mason jars. Stacks of white dishes displayed above the buffet. None of that is currently up, and while it doesn’t look horrible the way it is now... when I walk in there I know what it could be. It could be amazing. As I scrutinized every square inch of my house I realized, it’s a fixer upper. No, its not an old, abandoned house in Waco, Texas that Joanna and Chip will turn into a dream house, but it's my home to fix for my family and I will be doing that for the rest of my life no matter where we live. My job will always be to create a home for my husband to come home to everyday and for my children to launch from. Even though I will do that in a physical dwelling I know that even more so I will do that in my own heart. I will be what my husband comes home to and I will be the place my children leave when they are grown. I am their “home” and that is a weighty responsibility and one that I’m sure I will fail at on a regular basis. The truth is, I am the real fixer upper. I am the one that is a mess. Sure, I have some of my stuff together. I may have a good color of paint on the walls and maybe even pretty hardwood floors (covered in crumbs, of course) but there is work to be done. There are things to be torn down and things to be built up. There are things tucked away in the back of my closets that need to be exposed and thrown away. So even though I believe it is okay to dream about my house covered in shiplap and plan out ways to finish all of my house projects; please, Lord let that NEVER be more important to me than what you are trying to do INSIDE OF ME. I’ve seen every episode of Fixer Upper and love Chip & Jojo! I’m basically a not-creepy groupie, if that is a thing. I’m always amazed to see how they turn something horrid into something beautiful every single time; even when it seems as though the property is too far gone. The whole concept of a fixer upper is so much like us, don’t you think? Sometimes we look a lot like the abandoned house. Our foundation is weak and stuff is crumbling all around us. But the good news is that God will not leave us like that. He is the ultimate restorer, builder and decorator. He doesn’t have a budget and He never gives up. He meets us where we are and He fixes us. So when the days feel long and you feel undone remember who began the good work in you. 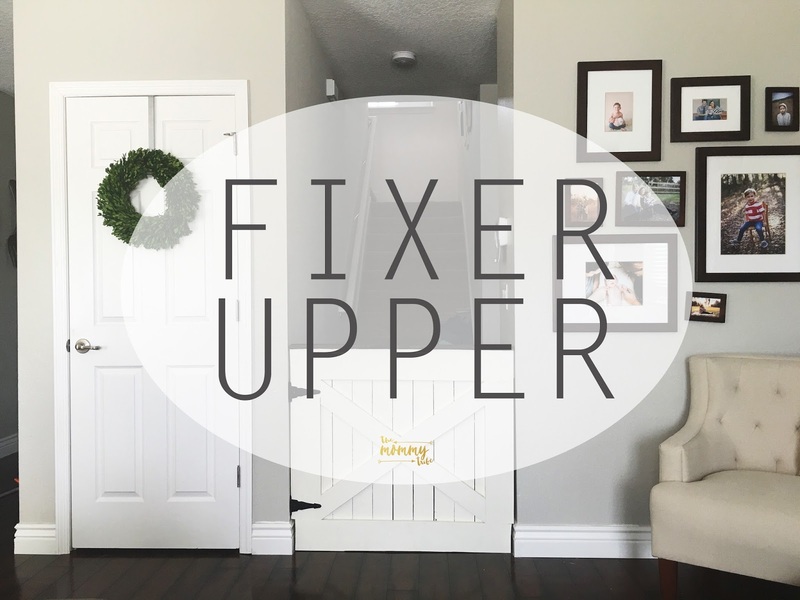 Remember this: THIS MOM IS A FIXER UPPER! He’s working on making you better and more glorious every single day. Pursue Him and be amazed at what happens to you. My heart has been incredibly burdened lately as I've noticed what other women around me are walking through. So many people are in the midst of life-altering circumstances… the kind you never think you'll actually have to deal with. But they are face-to-face with them, it is their current reality. I sat with a good friend of mine who talked about her niece, a sweet unborn baby whose future is unknown. The Lord has woven that precious little girl together exactly the way she is, with a great purpose. He knows everything about her, including the number of hairs on her head. He also knows the number of her days. But her parents don't. They face a lot of unknowns and have no solid answers to any of their questions. All they can do today is to trust the Lord with their little girl. As I listened to this woman's story over coffee, tears fell from my eyes. I was so embarrassed. I've never met this woman and I was crying. It wasn’t my baby or my family. But as I heard more about her and more about the test results, my heart began to hurt. I don't have to meet her to know how heartbroken she must be because I know the way a mother's heart loves. And I know the way a mother's heart hurts. And so my heart broke for hers. There are so many other stories that I could share here about friends facing loss, rare sickness, infertility….. But you know them too. They are your friends. We are all surrounded by hurting people. 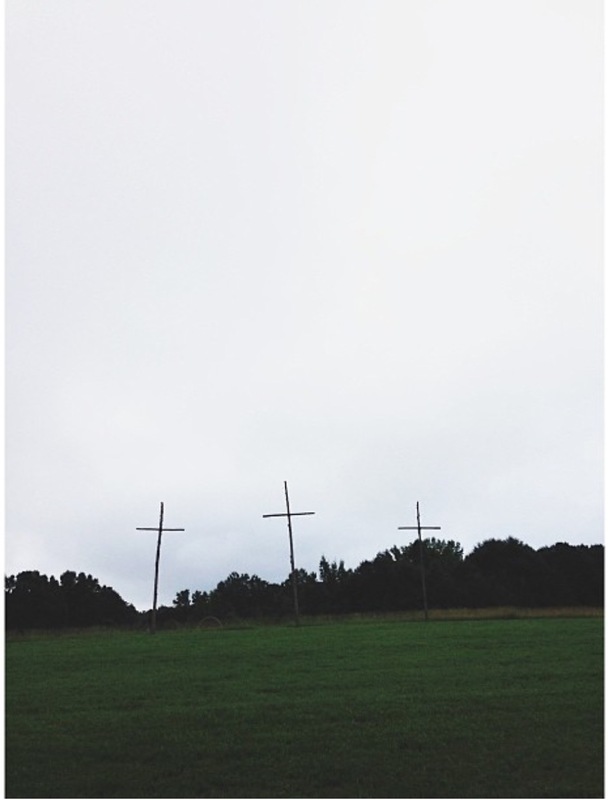 This season has left my heavy heart longing for Heaven. I've felt helpless as I've watch countless women face some of their hardest circumstances. 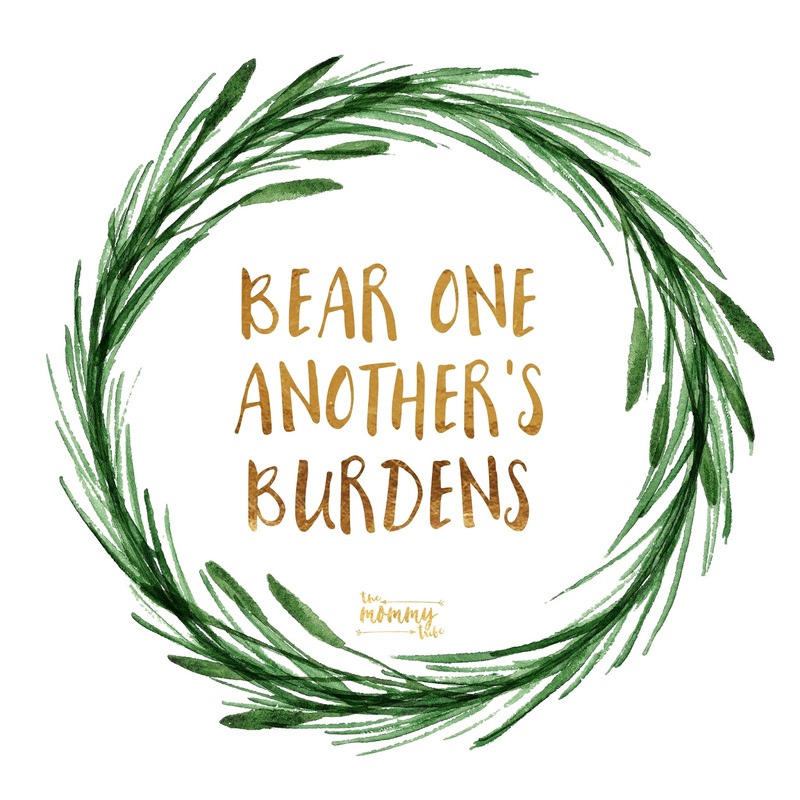 The Lord has clearly given me these four words over and over as I've wrestled with how to process other peoples suffering… Bear one another's burdens. I am not carrying a baby with an unknown future. I don't have a rare cancer. I'm not struggling to conceive a child of my own. But what if their stories became our stories? Their burden, our burden? 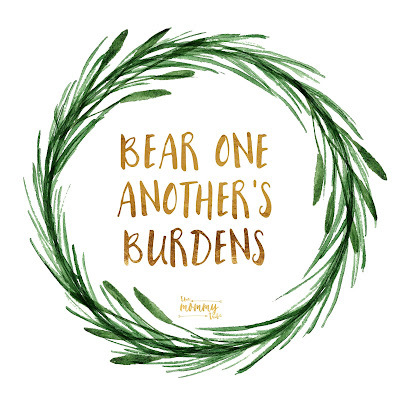 Because as we come alongside them and carry the burden we lighten their load. That’s what a friend does, right? We can't write out a connect-the-dots process of bearing someones burdens. It will always look different. It can range from huge financial sacrifices to dropping off a meal. But the one thing bearing another's burden should always include is praying for them. God always hears us. I'm guilty of forgetting the power or prayer and trying to only use my hands to "solve" someone else's problem. My prayer life needs work and I feel like this has been one area that God has challenged me lately. I'm praying for friends in a way I never have before and I'm praying for women I've never met. So friends as we memorize this verse let's live it out. Pick another women this week that is 'enduring it'. You know what I mean. Maybe she's in a tough marriage. Maybe she struggles to feel like she's enough. Maybe she can't pay her bills. Maybe she is battling cancer. Maybe she's losing a child. Or maybe she just feels like she is alone. Carry her burden. Don't make her do it alone. Take her to the Lord and watch what He does.